The bunny cushion arrived and looks very much at home. Received tapestry today (The Merchant's Ship) and have mounted it. It is very pleasing on the eye. Thank you for your faultless service and I am sure we will do business again. If you have other similar tapestries that would complement our recent purchase, don't hesitate to send an email. Thank you very much for the great customer service throughout the process of ordering my tapestry (Lady with the Unicorn). It looks amazing and I am very happy with it! Even the rod finishes are well decorated and complement the piece very nicely. I cant wait to hang it up and enjoy this classic piece. I will definitely be purchasing the pillows we first discussed in the near future. Our tapestry is very beautiful - definitely very nice quality. Thank you so much for your great service also. I just wanted to let you know that your parcel arrived today. Both the tapestries are very beautiful. Over the years we have obtained a number of tapestries from various providers - yours is by far the best quality. The colours are beautifully rich and the texture is a delight to the touch. Thank you for all your effort which is much appreciated. I have my tapestry (The Harvesters, hand woven tapestry) Shirley, safe and sound at home - have unrolled it and it is more beautiful than I expected so am very happy..... I really do love the tapestry and will treasure it forever. Thanks again. We love our new tapestry (Vine and Acanthus) - absolutely gorgeous and thank-you for your wonderful service and quick delivery. Our client is thrilled with the tapestry, it arrived in good order & is now hanging on their wall. The tapestry arrived this morning; it is absolutely beautiful. Many thanks for the extra information and all your help and assistance. I am really looking forward to hanging the tapestry and admiring it. The cushion covers arrived today and they are beautiful ... worth the wait! Thank you so much! Thank you very much for responding to my inquiry. It is sometimes very hard finding anything that even remotely resembles service these days, so I truly appreciate your communication. I just wanted to say thank you so much for all your help, I have really appreciated it, and certainly, if I need another tapestry in the future I know exactly where to come. Hi Shirley, I thought you might like to see the end result. The person I gave the cushion covers to really liked them. She sent me the attached photo. Lovely result. Thank you Shirley for your prompt and detailed response to my enquiries; I am more than happy to recommend Classic Tapestries to others due to your professional approach regarding my purchase. The Garden tapestry I purchased from you is exquisite and has made such an impact in the living room. Thank you for all your assistance and customer service - much appreciated! Rods have arrived and very happy with them. Thanks for your immediate response and quick delivery. Thanks Shirley for your amazing customer service. Your products are just beautiful and it has been a pleasure doing business with you. I shall be spreading the word to check out your site. Thanks again for all your help. Being new to the world of tapestries, I found your advice really helpful. With so many themes and styles available from your range, you've pointed me in the right direction. Thank you for sending the catalogues, I really enjoyed browsing through these, really beautiful and helped me with my final selection. "The Peacock" tapestry arrived in perfect condition. Thank you very, very much. It is beautiful!" Thank-you for doing everything you could to ensure my cushions arrived for the birthday date required – they are lovely and were well received! Thanks for offering the catalogues to browse through – they helped me make my choice and are absolutely gorgeous. Thank-you for your excellent service and the tapestries look fabulous. I appreciate all your assistance. The tapestry rod arrived yesterday. It was well packaged and in excellent condition. Everything has arrived in good condition. I'm pleased with everything!!! 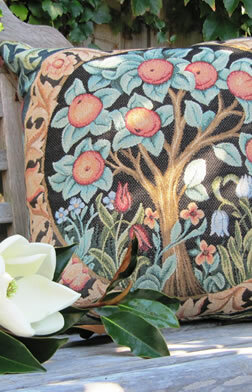 I have to say the poppy and flax print cushions are really lovely. I bought “Flanders Forest” from Classic Tapestries and it has made such a difference to my living room. Shirley was very helpful and even followed up to make sure I was happy with my purchase after the sale. I will buy from Classic Tapestries again shortly. I want some matching cushions! Many thanks for your prompt and caring service. The hanging rods arrived sooner than you promised so that was a real bonus! Just wanted to say thanks for the excellent service. My tapestry arrived on time and in perfect condition. Well done! Hi Shirley, Just letting you know that I have received my gorgeous tapestries. Look super hung up. Browsing through catalogues and absolutely spoiled for choice!! Thank you.